On April 7, 1933 brothers August A. Busch, Jr. and Adolphus Busch III decided to surprise their father, August A. Busch, Sr., with a six-horse Clydesdale team pulling a bright red beer wagon to commemorate the repeal of Prohibition. They couldn’t have known at the time that they were setting in motion one of the world’s most recognizable corporate icons. Now, the “gentle giants” are beloved and recognized well beyond the beer brand they represent. Children and adults can cozy up to these big guys at the Anheuser-Busch brewery in St. Gentle giants relax at the Clydesdale “prep school,” Grants Farm in St. Louis. Louis, Mo. which offers family friendly tours. Check out St. Louis Mom for her take on the tour. 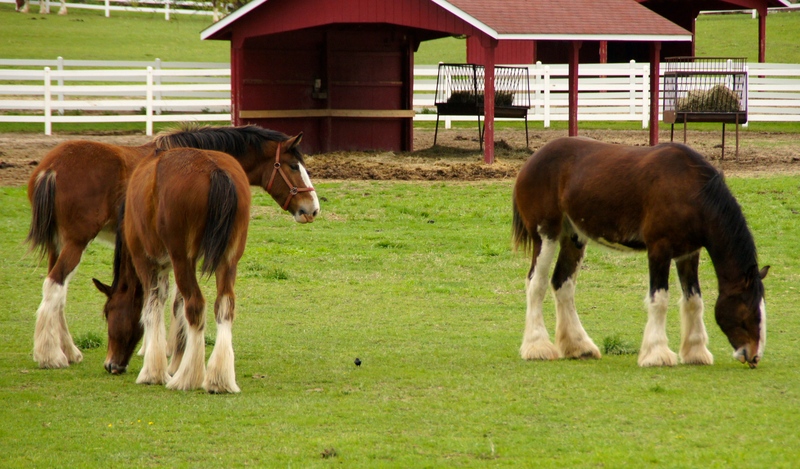 The horses also frolic in the fields at Grant’s Farm in St. Louis, the Clydesdale “prep school.” Grant Farm’s behind-the-scenes “Clydesdale Experience” tour provides an in-depth look at what it takes for a young Clyde to become an official Budweiser Clydesdale. Guests tour the stables while gaining an inside look into the operations, the training process, and daily horse maintenance. Heaven for horse-loving kids. Reserve ahead! Warm Springs Ranch, the 300-plus acre Clydesdale breeding farm located near Boonville, Mo., also offers tours. 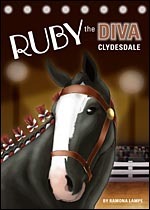 Not just any Clydesdales qualifies for one of the traveling teams or “hitches.” A Budweiser Clydesdale must be a gelding at least four years of age, stand 72 inches at the shoulder when fully mature, weigh between 1,800 and 2,300 pounds, have a bay coat, four white legs, a white blaze (that big stripe on his nose), and a black mane and tail, so not all the horses make the team. 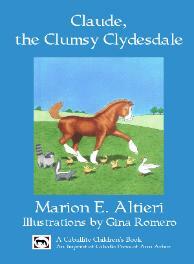 Ah, to be a Clydesdale! (aside from the gelding part.) 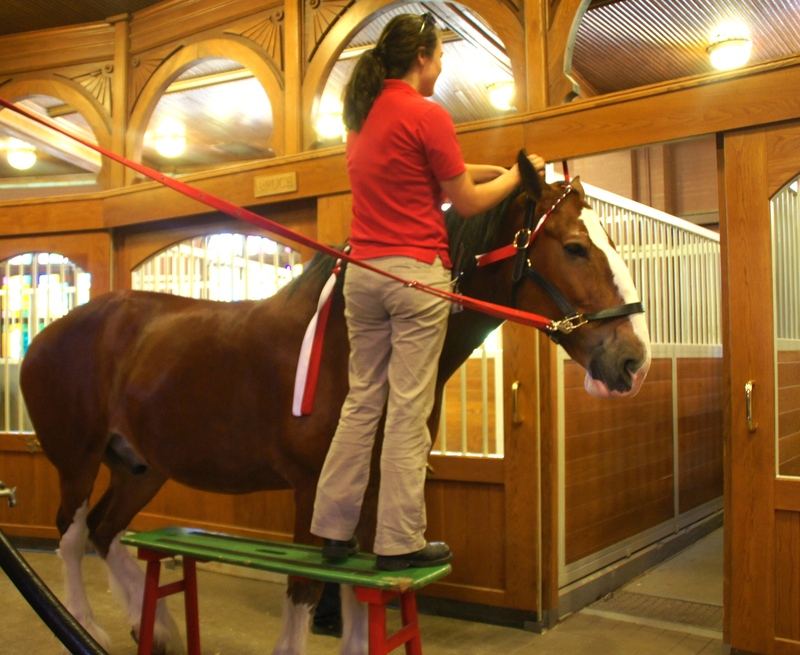 The official home of the Budweiser Clydesdales is an ornate brick, stained-glass, and chandelier-festooned stable, built in 1885 on the historic 100-acre lAnheuser-Busch St. Louis brewery complex. The building is one of three located on the brewery grounds that are registered as historic landmarks by the federal government. It’s much nicer and cleaner than most people’s homes. There, the horses are brushed, curried, trimmed and shod like movie stars. When relaxing they wear stunning red coats sporting an embroidered “A” monogram. At work they wear hand-crafted patent leather and brass harnesses that weigh in at 130 pounds, a mere speck if you weigh 1800 pounds yourself, and fancy plumes on their heads. The horses and the brewer have come a long way since the dark days of Prohibition from 1920 to 1933. Rather than close its doors, as more than half of the nation’s breweries did, Anheuser-Busch diversified and marketed more than 25 different non-alcohol products such as soft drinks, truck bodies and ice cream, among them Bevo, a non-alcohol cereal beverage. Yum. It’s no wonder the Busch family was as happy as Clydesdales in clover when the twenty-first amendment to the U.S. Constitution ended Prohibition. But they wouldn’t have made it through Prohibition without ingenuity and savvy marketing skills and they soon realized the marketing potential of that horse-drawn beer wagon. So, the company also arranged to have a second six-horse Clydesdale hitch sent to New York on April to celebrate the event. The Clydesdales drew a crowd of thousands as they clattered down the streets of New York City to the Empire State Building. After a small ceremony, a case of Budweiser was presented to former Governor Alfred E. Smith in appreciation of his years of service in the fight against Prohibition. Recognizing that they had a pretty good thing going with the Clydesdales the company extended their tour through New England and the Middle Atlantic States, drawing giant crowds along the way. That included a stop in Washington D.C. in to reenact the delivery of one of the first cases of Budweiser to President Franklin Delano Roosevelt. Still, the brewers couldn’t have imagined the horses they harnessed as a publicity stunt would turn into a brand icon and the annual stars of the Superbowl. 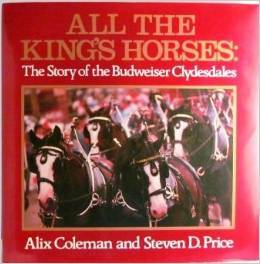 All the King’s Horses: The Story of The Budweiser Clydesdales by Steven D. Price.